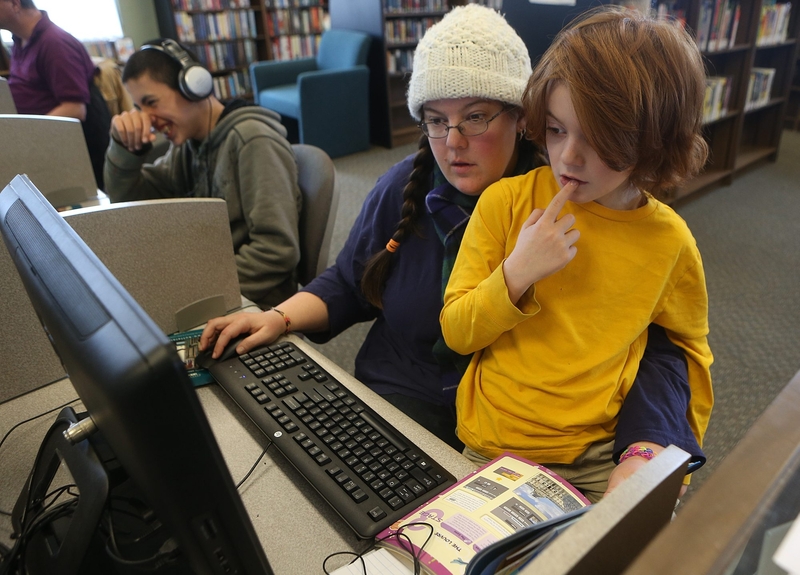 Home-schooling mom Jennifer Balazadeh helps her son, Machias, 7, with a lesson on a computer at the North Collins Public Library on Sunday. Western New York moms know exactly what Brigid Schulte is talking about. They know about being busy. And multitasking. And about not having any real leisure time to do anything just, you know, for fun. Jennifer Balazadeh, for instance, loves to read. But in her busy schedule, as a home-schooling mother of two children, that often gets pushed to the very end of the day. “I read at night after they’ve gone to bed,” said Balazadeh, of her 7-year-old son and 5-year-old daughter. The North Collins resident makes the best of it. This is what women in the Buffalo region have to say: “Overwhelmed” resonates here. The new book by Schulte, a reporter for the Washington Post, is not just a story of parents living in urban areas far away. It’s a story of their lives, here and now. Lisa Williams, a working mother who is an assistant professor in the management department at Niagara University, also knows what the pressure is like. Williams said she spent years in graduate school when her son was younger; now that he is a teenager, she still has to carefully balance work and family time. • Researchers have found that both men and women with children spend twice as much time multitasking today as their peers did a generation ago in 1975. • Researcher Mihaly Csikszentmihalyi has found in some studies that men work on about 1.5 tasks at a time, while mothers work on about 5. • Longer working weeks are being phased out or trimmed in many places in Europe, including France, which now has a 35-hour workweek. • Researchers have found that play is important to us as both children and adults. In “Overwhelmed,” Schulte recounts her own struggles to balance a demanding job as a journalist with the needs of her husband and two kids. Williams, who teaches her students at Niagara about work-life balance, said that the way today’s society is, many people are under extreme pressure to work extra hard and be ultra-productive. Some of that is about keeping up with everyone else, she said. “It could be simpler,” Williams said. This situation is true for many parents, both moms and dads, Schulte explains in her book. Still, Schulte puts a special focus on mothers – who often are both working and taking care of the needs of other family members, usually with little time for themselves. Moms in Western New York said the idea of being taxed by daily life is not foreign to them. One Southtowns mom said everybody she knows seems busy these days. “But it’s all what you make it,” said Jennifer Higgins, a mother of two from Orchard Park who works full time and tries to divide family duties with her husband. When did Ruzycki, a Gowanda mom, last have any sort of pure relaxation time? “Probably a year ago,” mused Ruzycki, who works full time and is raising two children with her husband, David. Does she remember what she did with it? “Probably just lunch or dinner with my girlfriends,” she said. As for Balazadeh, she said it’s important to her to be there for her kids and give them lots of time. She said she is glad that she is not working outside the home, as she has done in the past; her husband works. That helps with their schedules and the care of the children. Balazadeh said she is trying to make more time for leisure in her daily life.